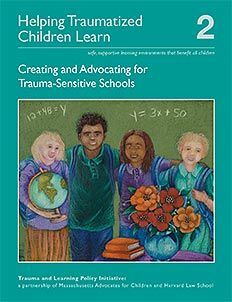 Volume 2 of Helping Traumatized Children Learn: Creating and Advocating for Trauma-Sensitive Schools, safe, supportive learning environments that benefit all children offers a Guide to a process for creating trauma-sensitive schools and a policy agenda to provide the support schools need to achieve this goal. Grounded in theory and practice in schools and with families, the Guide is intended to be a living document that will grow and change as more schools become trauma sensitive and add their ideas. The policy agenda calls for changes in laws, policies, and funding streams to support schools in this work. Together, the online learning community and the book are designed to complement each other, helping to build a growing and increasingly visible trauma-sensitive learning community. You can download a free PDF of the book by completing the form to the right. Or you can purchase a beautiful, bound print copy. If you find our publications useful, please consider a donation of any amount. Potential issues with downloading: If you are using a Firefox browser on a Mac, you may experience a blank white screen when opening the PDF file. Instructions for correcting this problem are here. If you have other issues/problems downloading our publications, please contact us. TLPI will never share your personal information with any third parties.